Westside Boatman is an overstable speed 11 driver with lots of glide and control. It can handle a surprising amount of wind. If your PDGA rating is more than 950 you may want to throw Boatman backhand. 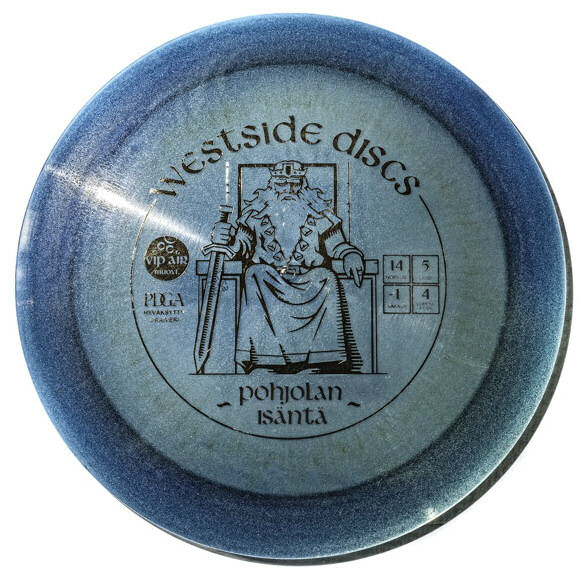 For less experienced players the Westside Boatman can be best used as a long and precise sidearms throw disc, or at situations where a right-handed players needs to go left. Westside Boatman is a PDGA approved disc. Fast overstable long-range driver for big arms. Full product description will be available after extensive testing period. Westside Giant is a PDGA approved disc. Westside King is a fast stable speed 14 driver good for ultimate distance without sacrificing control. It has a solid reliable flight without being too overstable. Westside King has a relatively high and predictable fade. Higher weights are more stable than lower weights. The King is an easy way to get extra meters to your play. Westside King is a PDGA approved disc. Westside's first production disc is a workhorse. A steady, reliable driver that will deliver consistent results. Dependable, predictable distance for skilled players, and a good driver for new players in lighter weights. Made from the new VIP super-durable plastic, the Northman will deliver pinpoint accuracy throw after throw. Westside Northman is a PDGA approved disc. Westside Sword is a speed 12 stable/overstable distance driver with lots of glide and accuracy. The Sword reacts well to different release angles and holds the angle during the whole flight. This makes the Sword great for straight shots, long hyzers and long unhyzers. Westside Sword is suitable also for sidearm throws. You can have most out of this disc if your PDGA rating is around 900-950. Westside Sword is a PDGA approved disc. Reliable and straight flying professional midrange driver. Full product description will be available after extensive testing period. Westside Warship is a PDGA approved disc.